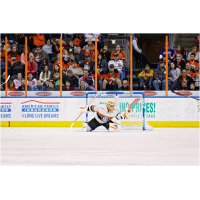 INDEPENDENCE, MISSOURI - The Missouri Mavericks announced Wednesday afternoon that net-minder Josh Robinson has been called-up to the Springfield Falcons of the American Hockey League (AHL) on a professional tryout (PTO). "Developing players for the next level has been a top priority for us this season," said Richard Matvichuk, Head Coach & Director of Hockey Operations for the Missouri Mavericks. "Robinson has had a great season with the Mavs and has earned the right to play in the American Hockey League. We as an organization are very happy for him." Robinson currently owns a near-perfect 25-0-0-1 overall record and the ECHL record for longest single-season goaltender win streak (21 consecutive wins). In the same morning announcement, the Mavericks are welcomed back forward Kellen Jones, who has been returned on loan from the Bakersfield Condors (AHL). Jones appeared in 16 games, scoring 4 goals and 13 assists, for the Mavericks prior to his call-up on Nov. 23, 2015. Tickets for all Missouri Mavericks home games are available online at TicketMaster.com and in-person at the arena box office.